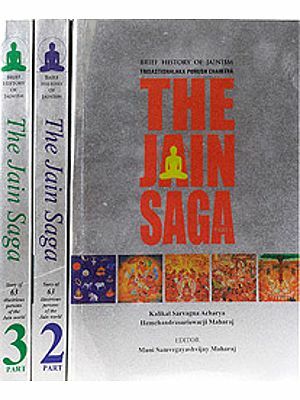 The present book AN ENCYCWPAEDIA OF JAINISM, is a compilation' forming' an epitome having for its basis the most orthodox principles, doctrine and tenets as found in the original work of authority and high antiquity as promulgated on the subject by Jaina speculative writers and conformed to by accurate thinkers in their spiritual inquiries. 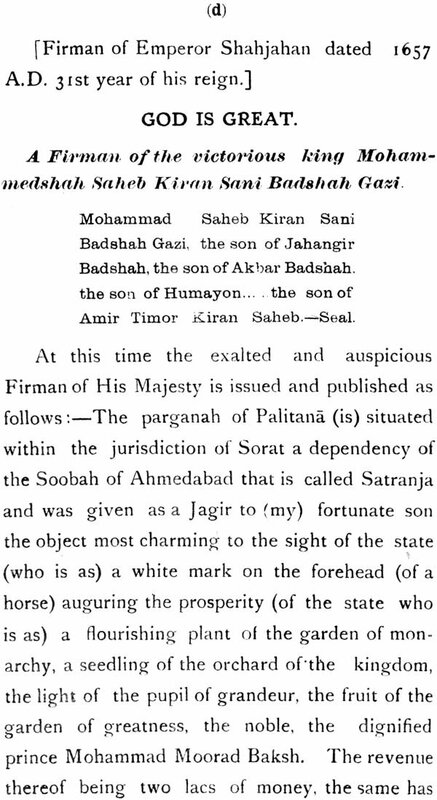 In humbly placing the present book entitled An Epitome of Jainism on the table of the World library, a few words of explanation by way of an apologia are it appears, needed to justify the claims, it lays upon the valuable time of its various readers. 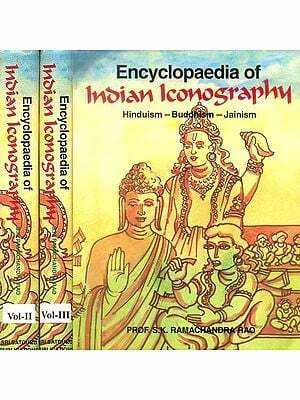 And we may state at the outset that it is not an attempt to supersede any of the modern treatises on Jainism. Its claim to attention, if it has my, arises from the fact that it is but a compilation forming an epitome having for its basis the most orthodox principles, doctrines and tenets as found in the Jain original works of authority and high antiquity, or promulgated on the subject by Jain speculative writers and conformed to by accurate thinkers in their spiritual inquiries. But to connect together these detached fragments of a subject never yet treated as a whole, from the real Jain point of view, in these days of transition under western refinement; to harmonise the different Portions of the seemingly discordant notes lying' scattered over -the grey pages 'of works handed down from .the spiritual sire to the spiritual son, by freeing them from errors which they have become more or 'less shrouded with, through the' revolution' of ages and empire's, or through long-standing conventions which have come down to us from time immemorial, must require a power of interpretation and original speculation. To other originality than this, the volume lays no claim. For it goes without saying' that in. the present age of the, cultivation of universal learning when the literati of both the East and the West are sedulously engaged .in exploring the rich and almost. inexhaustible mines of the ancient lores of India, it would indeed be very' presumptuous on the part of anyone to imagine even that he had contributed something new and original in the domain of ideas and ideals. But still for all that there is ample scope for thinkers to improve upon the methods of philosophising and .interpreting the old ideas and ideals, .tenets and doctrines in perfect keeping with the changed conditions of the times to suit, newer environments without deviating in the least from the real spirit and import which, they are replete with For it is only 'the form that changes and must change, spirit always remaining essentially the same all through. And if there, is any deviation anywhere from the real spirit it should be understood as due' to something wanting- in the qualification of the interpreter. To do this we had, therefore, had to begin with, the enunciation and interpretation ' of the Jain principles of epistemology as propounded by the omniscient sages and scholars' of bye-gone days. Epistemology really supplies the key-note' to the interpretation and understanding of a system, of thought and' culture. 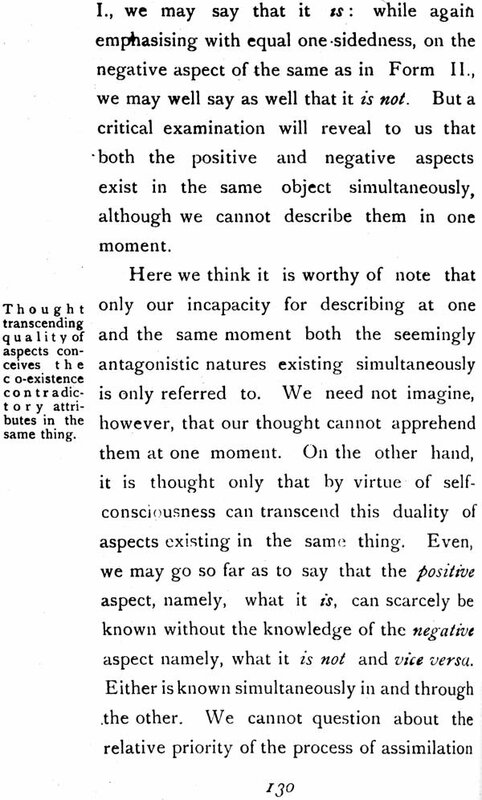 I t gives us the stand point, to have' a clear and, correct, vision into the metaphysics of things and' thoughts.' 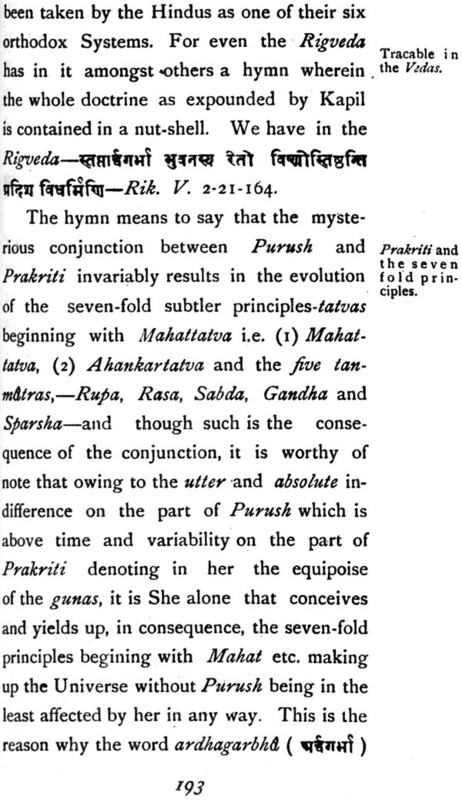 This is the' reason why every system .of thought and culture ~n 'India really begins with a' clear exposition of the principles of its epistemology, the moment it, has done with 'describing in 'the briefest manner possible, its own, hypothesis; its necessity arid sublimity, and finally its right t9' be heard. 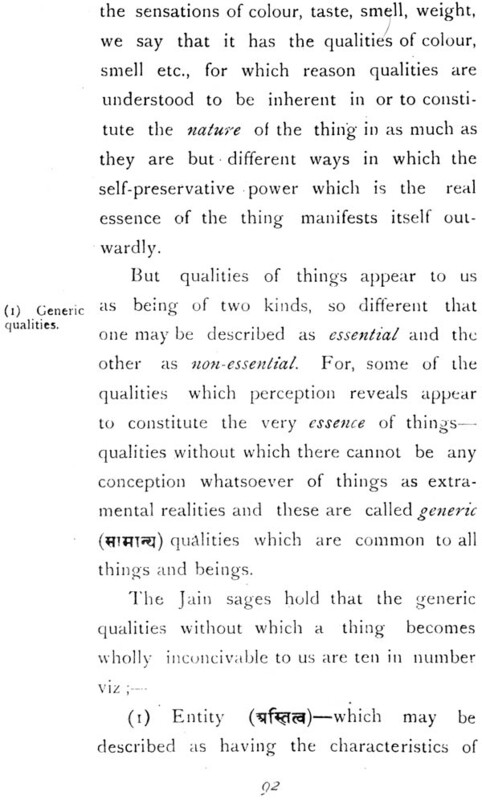 So is the case with jainism 'itself and having, therefore, explained all these, in brief 10 our Introduction and 1Il Chapters I and II from the .lain point of view, we have begun discussing its science and philosophy from Chapter . 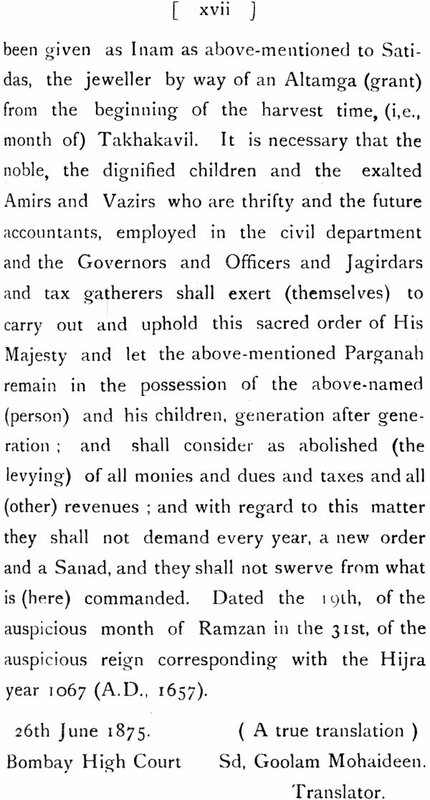 I II headed as 'Knowledge and Its Forms', But with Chapter IV on Epistemology and Logic' begins the real discussion which ends with Chapter V I I I on 'Syadvad ultimately and,. finally indentifying logic with ontology. 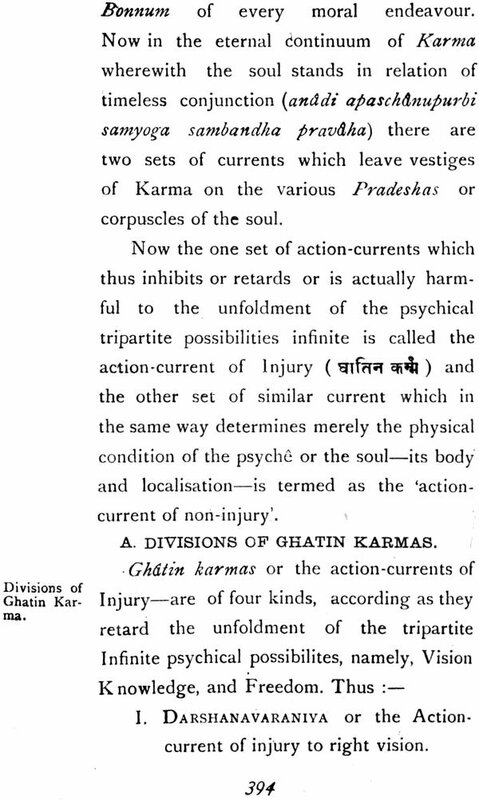 A patient perusual of these Chapters will clearly show the readers as to how the formal logic of-the other schools-of thought' becomes, in the hands of ~he lain sages, metamorphosed, .as it were, into transcendental logic in and through the processes of the dialectical movements of thought and Being inherent in their very nature. But however it is generally held by students of modern thought and culture that this dialectic method of reasoning identifying logic with ontology is of Hegelian,' origin and .meaning. Indeed the word dialectic means reasoning for and against, exposing thereby fallacies and inconsistencies, and clearing them away. . Socrates used this method of reasoning in his ontological polemics with the .sophists of his time, putting them between the horns of two definite alternatives. But in modern philosophy of the West, it was Kant who revived it in his exposing the contradictions involved in the fundamental assumptions of dogmatic philosophy and in the popular conceptions of Soul, WorId and God. 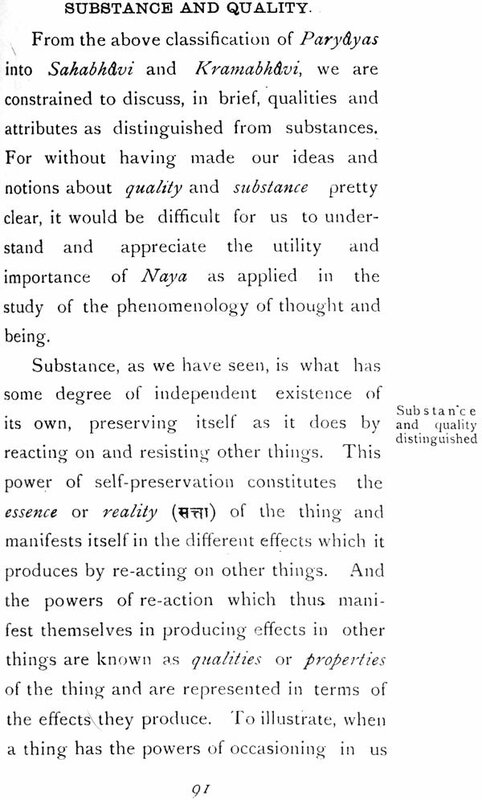 But it was left to Hegel to give a new meaning to dialectic and to interpret it in cl new light altogether. For with Hegel, Being contains within itself oppositions and contradictions. Every thought, every reality is but a mixture of Being and non-Being. Dialectic with Hegel, therefore, is equivalent to Self-development or un-foldment, and the world-process itself is a process of dialectic, of antithisis and synthesis, making differences serve-as means to higher unities. The legitimate out-come of working out the Hegelian interpretation of the world-process as shown in his dialectic, is the pronouncement of the eternity of the world-process. And/with it the' soul is also declared to be in the never-ending process of higher and higher evolution without al1Y ultimate rest or quiscent anywhere. 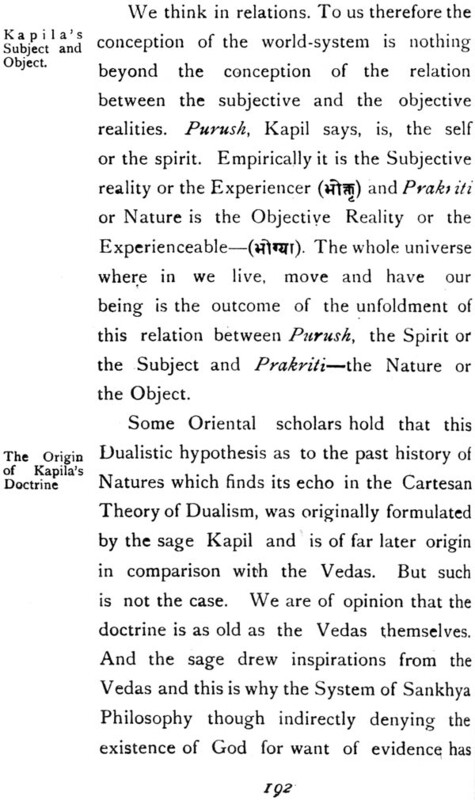 But those who have followed our exposition of the' Jain principles of epistemology ending with Syadvada running up to Chapter XI I, will be at one with us when we state that the dialectic method of reasoning identifying logic with meta- physic was not Hegel's own making. 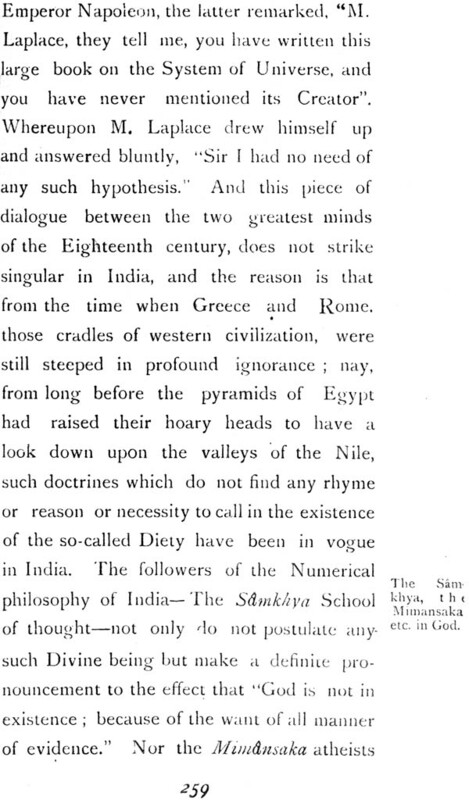 It originated with the J ain sages and omniscient kevalins, and has been prevelant in the field of philosophy in India from a time when \ Greece and Rome those cradles of European civilization, were still steeped in the darkness of ignorance. 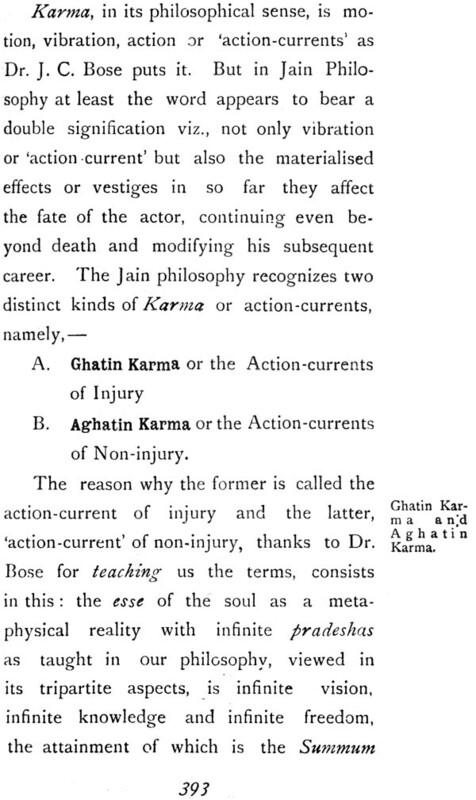 I t is true that with the Jains the Absolute is but an Expression of Unity in Difference as distinguished from the Absolute beyond the Relative of the Vedantins (Vide Chapter, XI), and that the world-process is also without beginning and end (Vide Chapter XII to' XV) ; but the soul according to Jainism does not remain forever entangled in the meshes of the dialectic process of evolution without knowing any rest or repose anywhere. 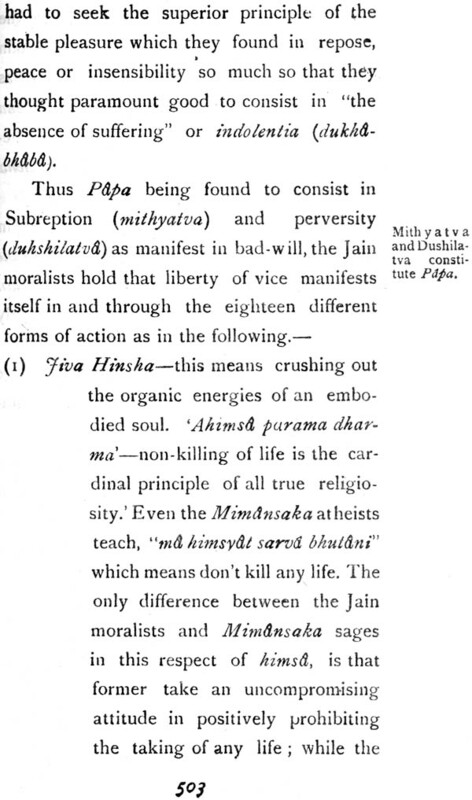 The Jains, as well 1.S every other system of Indian thought and' culture, hold that the Jiva will never remain eternally caught up in the never-ending process of evolution.